Blood pressure levels can fluctuate throughout the day and can easily change as a result of stress, physical activity or even talking, so clinic-based readings are not always representative of an individual’s true blood pressure. To get a true reading, 24-hour ambulatory monitoring is the gold standard for diagnosing hypertension and is currently recommended for all patients with raised blood pressure readings in the clinic. This involves wearing a monitor throughout the day and night, with readings taken automatically every 15–20 minutes, which can be uncomfortable for some people. 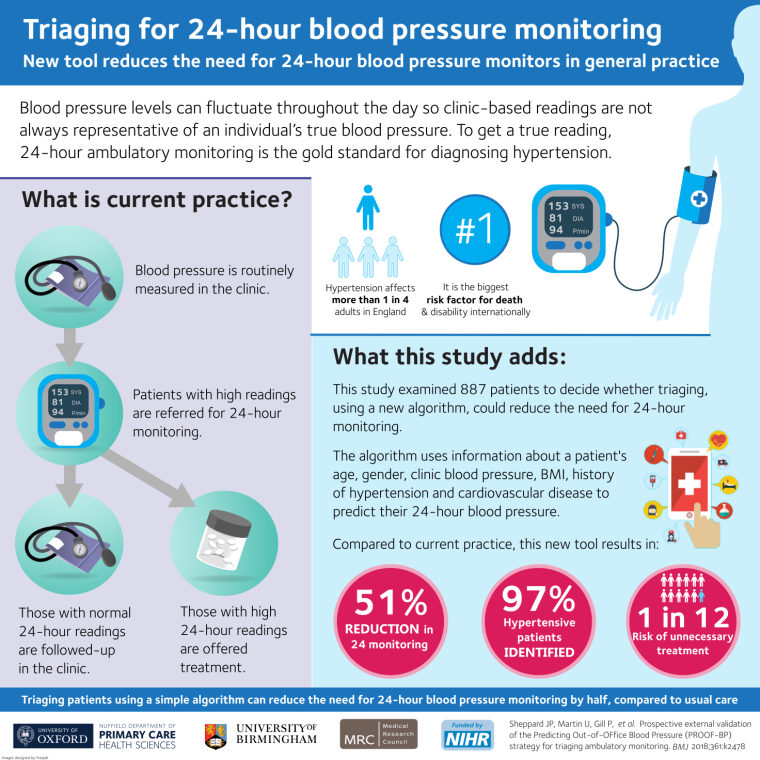 We have previously analysed data from 2000 patients to understand the differences between clinic and 24-hour blood pressure readings, and developed an algorithm that can accurately predict true blood pressure. In this study, we evaluated this algorithm in 887 patients with suspected hypertension recruited through 10 general practices and one hospital in England. Doctors participating in the study took three blood pressure readings during their consultation to decide whether the patient required 24-hour monitoring. The patient’s readings were also inputted into the prediction tool along with basic information from their electronic health record including their age, gender, BMI, history of hypertension and presence of cardiovascular disease. The algorithm identified whether a patient had a normal blood pressure, a high blood pressure or required further investigation. We found that using this approach correctly predicted patients with hypertension in 97% of cases when compared with true blood pressure readings, but around a quarter of patients without hypertension could have received potentially unnecessary treatment. Importantly, it reduced the need for intensive 24 hour blood pressure monitoring by half. This work was published in the BMJ and can be found here. The tool is freely available online here: https://sentry.phc.ox.ac.uk/proof-bp.